The Big Boom Analytic Dashboard Report was created as an attempt to simply the Google Analytic reporting system for our clients. We’ve created this dashboard, which is free, to bring the 10-12 specific reports to the surface. This dashboard gives you all the essential analytic information about your website in a quick and easy layout. 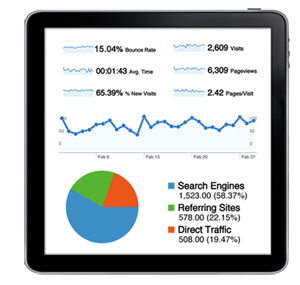 To add this dashboard into your Google Analytics account, simply log into Google and click on the link below. This will bring up a box that will let you select the specific account that you’d like to add it to. If you only have one Google Analytics site (only tracking one site) it might auto-add the report to that account. Once the dashboard has been added to your account, you can view it by clicking on Customization at the top left of your analytics screen. Under customization you’ll see Dashboards as the first option. You can also setup the report to automatically send an email at any desired interval.